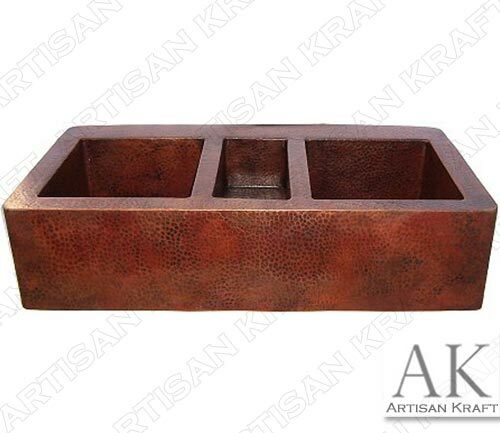 Copper kitchen sink with a triple basin design. This triple basin model is very functional for a busy kitchen. It also looks great. The sleek straight line design gives it a contemporary feel while being a traditional design. Rounded corners give the soft edges a natural feel. The surface is a hammered finish but can be made smooth. A hammered finish is indented copper. You can see and feel the difference between the smooth and hammered finishes. Match it with a cast stone range hood. This farmhouse kitchen sink can be installed under mounted below the surface of your counter. It is also fully finished all around so it can be installed vanity style on top of the counter or flush with the counter. We provide global shipping on all of our items. Price: Please call us or email us for the cost.